How many helpers does it take to change a light bulb? Just one, but the light bulb has to want to be changed. The clients own the responsibility to resolve their ambivalence. 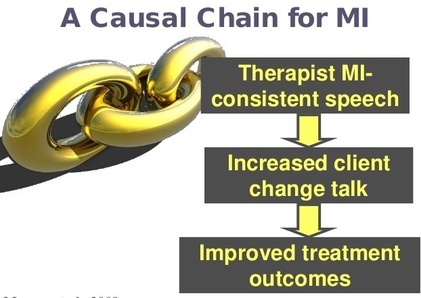 Prescribing specific methods or techniques is ineffective; allowing clients to pursue their own means of change increases likelihood of success. Clients’ resistance and denial are viewed as a reaction to helpers’ behaviors, not as clients traits. The client/helper relationship is seen more as a collaborative and friendly partnership than as an expert/recipient or teacher/student relationship. Express empathy Be non-judgmental; listen reflectively; accept ambivalence; see the world through the clients’ eyes. Accurately understanding the clients’ experience can facilitate change. 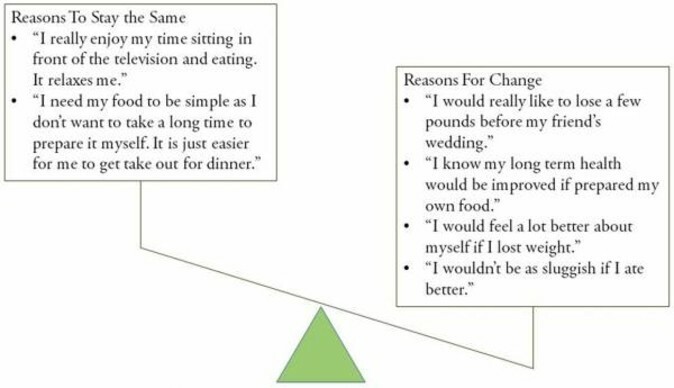 Develop discrepancy This help clients to perceive difference between present behavior and desired lifestyle change. Clients are more motivated to change when they see what they’re doing will not lead them to a future goal. Avoid argumentation Helpers gently diffuse clients’ defensiveness. Confronting clients’ denial can lead to drop out and relapse. When clients demonstrate resistance to change, helpers change strategies. Roll with resistance Reframe clients’ thinking/statements; invite clients to examine new perspectives; value clients as being their own change agents. Support self-efficacy Provide hope; increase clients’ self-confidence in ability to change behaviors; highlight other areas where clients have been successful. Empower - to empower the clients, encouraging hope and optimism. What is the Righting Reflex? It is the natural inclination we have to make it better for another person. What’s the danger? We tell the other person what to do, how to do it, and why they should do it without talking to them and learning what they think. It creates resistance in that we move away from the partnering stance of MI and into the expert top down role. 1. Engaging: is the process by which both parties establish a helpful connection and a working relationship. Therapeutic engagement is a prerequisite for everything that follows and it involves developing a working alliance. Rationale: Communicates respect for clients. Also, clients are more likely to discuss changing when asked, than when being lectured or being told to change. 2. Focusing: is the process by which providers and clients develop and maintain a specific direction in the conversation about change. In the course of helping relationships, a direction towards one or more change goals usually emerges. Utilize the “Spirit” of MI: When “instructing” is necessary, recognize “where” your client is and only provide relevant advice/information. 3. Evoking: involves eliciting the clients’ own motivations for change, and it has always been at the heart of MI. It occurs when there is a focus on a particular change and the providers harness the clients’ own ideas and feelings about why and how they might do it. Evoking is having the clients voice the arguments for change. 4. Planning: encompasses both developing commitment to change and formulating a specific plan of action. It’s a conversation about action that can cover a range of topics, conducted with a sharp ear for eliciting clients’ own solutions, promoting their autonomy of decision making and continuing to elicit and strengthen change talk as a plan emerges. 1. Ask Evocative Questions: Ask open question, the answer to which is change talk. 2. Explore Decisional Balance: Ask first for the good things about status quo, then ask for the not-so-good things. 3. Ask for Elaboration: When a change talk theme emerges, ask for more details. In what ways? Tell me more…? What does that look like? 4. Ask for Examples: When a change talk theme emerges, ask for specific examples. When was the last time that happened? Give me an example. What else? 5. Look Back: Ask about a time before the current concern emerged. How were things better, different? 6. Look Forward: Ask what may happen if things continue as they are (status quo). Try the miracle question: If you were 100% successful in making the changes you want, what would be different? How would you like your life to be five years from now? 7. Query Extremes: What are the worst things that might happen if you don’t make this change? What are the best things that might happen if you do make this change? 8. Use Change Rulers: Ask, “On a scale from zero to ten, how important is it to you to [target change] - where zero is not at all important, and ten is extremely important? Follow up: And why are you at ___and not _____ [lower number than they stated]? What might happen that could move you from ___ to [higher number]? Instead of “how important” (need), you could also ask how much you want (desire), or how confident you are that you could (ability), or how committed are you to (commitment). Asking “how ready are you?” tends to be confusing because it combines competing components of desire, ability, reasons and need. 9. Explore Goals and Values: Ask what the cleints’ guiding values are. What do they want in life? Using a values card sort can be helpful here. If there is a “problem” behavior, ask how that behavior fits in with the person’s goals or values. Does it help realize a goal or value, interfere with it, or is it irrelevant? Rationale: Affirmative responses or supportive statements by helpers verify and acknowledge clients’ behavior changes and attempts to change. 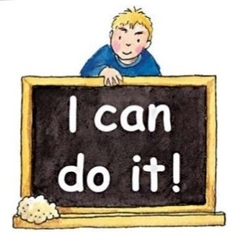 When providing an affirmation, helpers should avoid statements that sound overly ingratiating (e.g., “Wow, that’s incredible!” or “That’s great, I knew you could do it!”). Rationale: Reflective listening is the primary way of responding to clients and of building empathy. "You're feeling uncomfortable with your _______." "You are angry with/about ___________." "You've tried to do _______ before and it has not worked for you." "You are frustrated with trying to _________." "So, if I understand you so far, you _____________." "You are wondering if you should do something about ____________." "I can see how you might feel ______ at this point." Rationale: Summaries are used judiciously to relate or link what clients have already expressed, especially in terms of reflecting ambivalence. Summaries are also a good way to either end a session (i.e., offer a summary of the entire session), or to transition a talkative client to the next topic. "You are very considerate of how your decisions effect other people." "I can see that it's important to you to be a good parent." "You've really changed the way you ____________. How do you feel about that?" "What is it about your ___________ that others may see as reasons for concern?" "What would be the good things about your child (your baby/you) being/having __________?" "How has __________ stopped you from doing what you want to do?" "How do you feel about ___________?" about ___________. Why do you want to learn about __________?" "What makes you think that you need to make a change?" "If things worked out exactly as you like, what would be different?" "If you decided to change, what do you think would work for you?" "What concerns do you have about making changes?" "What things make you think that this is a problem?" "What difficulties have you encountered trying to change your __________?" Reframing. With this strategy, the helper invites clients to examine their perspective in a new light, thereby giving new meaning to what the clients have said. Rolling with Resistance. With clients who are extremely unreceptive to any idea or suggestion, this technique can be effective. It involves a paradoxical element, which can often bring the client back into a more balanced, non-combative perspective. Client: "But I can’t stop smoking. All of my friends smoke!" Helper: "And it may be that when we’re finished here, you’ll decide that it’s worth it to you to keep on smoking. Right now it may be too difficult to make a change. That decision is yours to make." "It's okay if you don't think any of these ideas will work for you, perhaps you've been thinking about something that might work instead?" "Ultimately, it is your decision. So, what would you like to try?" "You are right. I am concerned about your _______, but you are the one in control." "I don't understand everything you are going through, but if you want to share what you've tried, maybe together we can find something that could work for you." "Would you like to talk about some ideas that have worked for other moms and use what works for you?" Rationale: Assessing readiness to change is a critical aspect of MI. Motivation, which is considered a state not a trait, is not static and thus can change rapidly from day to day. Rationale: When relevant, new information should be presented in a neutral, nonjudgmental, and sensitive manner that empowers clients to make more informed decisions about quitting or changing a risky/problem behavior. "How important is this to you?" "How much do you want to _______________?" "How confident are you that you can make this change?" "What encourages you that you can _______________, if you want to?" discussed some options that have worked for others, which ones sound like the best fit for you?" The process of reflective listening involves hearing what the client says and either repeating or paraphrasing back to the client, or reflecting the feeling you believe is behind what the client says. Different levels of reflective listening can be distinguished. Simple Reflection. Helper simply rephrases what the client says. Helper: "Quitting smoking seems nearly impossible because you spend so much time with others who smoke." Client: "Yes, right, although maybe I should." Amplified Reflection. Helper exaggerates the client’s statement to the point client may disagree with it. Helper must not be mocking or patronizing. Helper: "Oh, so you couldn’t really quit smoking because then you’d be too different to fit in with your friends." Client: "Well, that would make me different, although maybe they might not really care if I didn’t try to get them to quit, too." Double-Sided Reflection. Helper reflects both the current, resistant statement, and a previous, contradictory statement the client has made. Helper: "You can’t imagine how you would be able to not smoke with your friends, and at the same time you’re worrying how it’s affecting you." Client: "Well, yes, I guess I have mixed feelings." Shifting Focus. Sometimes MI goals are better achieved by simply not addressing the resistant statement. Helper:"Well, we’re not really there yet; I’m not talking about your quitting smoking here. Let’s just keep to what we’re doing here - talking through the issues - and later on we can worry about what, if anything, you want to do about smoking." Client: "Well, I just wanted you to know." the key question as a way to solidify commitment to change. The timing of when the key question is asked and the intent of the question, helps the helper assist the client to move towards commitment to the targeted change. The key question is posed when the client stands at the precipice of change; the answer indicates whether the client is ready to jump or not. Decreased resistance. The wind seems to have gone out of the sails of resistance. Dissonance in the counseling relationship diminishes, and resistance decreases. Decreased discussion about the problem. The client seems to have talked enough about the area of concern. If the client has been asking questions about the problem area, these stop. There is a feeling of at least partial completion, of waiting for the next step. Resolve. The client appears to have reached some resolution and may seem more peaceful, relaxed, calm, unburdened, or settled. This can also have a tone of loss, tearfulness, or resignation. Change talk. Whereas resistance diminishes, change talk increases. Clients make direct statements about a desire to change, the ability to change, the reasons or benefits of change, and the need to change (the disadvantages of the status quo). They may also make statements about intention to change. Questions about change. Clients may begin to ask what they could do about the problem, how people change once they decide to, and the like. Envisioning. The client talks about how life might be after a change. This can be mistaken for resistance; that is, looking ahead to change often causes a person to anticipate difficulties if a change were made. Of course, the client may also envision positive outcomes of change. Experimenting. The client may have begun experimenting with possible change actions since the last session. A statement indicating that the helper is pulling together what the client has said. A summary of the client’s perceptions of the issue, including any reasons or need for change noted by the client. A summary of the client’s ambivalence, including the benefits of the status quo. 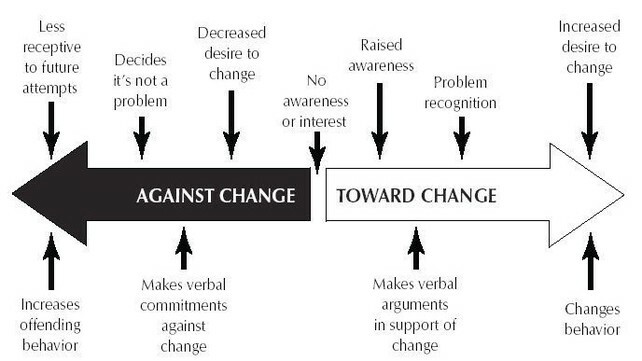 Objective evidence relevant to the importance of change. A restatement of desire, ability, and commitment to change. 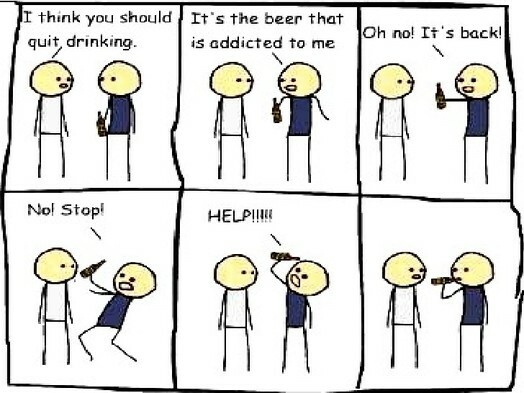 The helper’s assessment of the client’s situation, especially when it matches the client’s concern. 2. See—observe or recognize the skill in action. 3. Do in slow motion—often a writing task or a skill in isolation, many times done in a group situation. 4. Perform—isolate skills and do them in real time. 5. Build—work from easier to more complex and chain more complicated skills together. 1. Using multiple modalities engages different learning styles. 2. Slowing the learning down enough to see the nuances allows people to experience the complexity of the skills. 3. Stepping people through the skill, before asking them to produce it in “real time,” builds confidence in their ability to do so. 4. Participants feel readier to take on complex skills as well as learn the nuance of technique. William Miller has used the analogy that learning MI is like learning to play the piano Typically, he uses this analogy in the context of a brief (e.g., 2-hour) presentation and then assuming readiness to “do MI” (Rosengran, 2009). 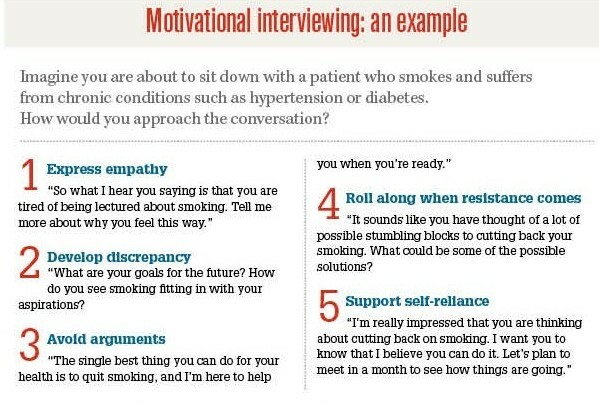 The analogy may extend to completing all of the materials on the copiing.us’s Motivational Interviewing segment. Although some people may complete a 2 hour workshop or absorbe all of the written materials and videos on this site and have learned the essential basics of piano playing, it is typically through the tutelage of an experienced piano teacher that the skills come to life. Rosengren, D.B. (2009). 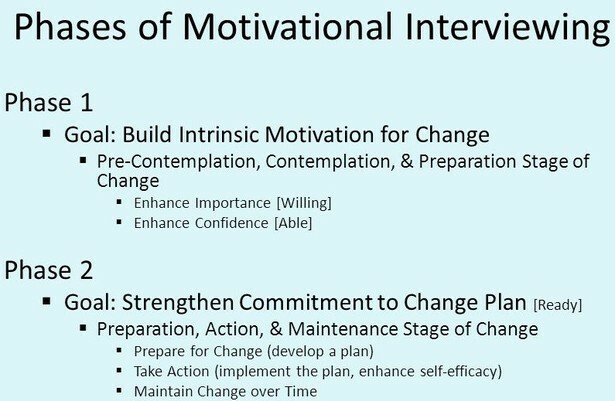 Building Motivational Interviewing Skills - A Practitioner Workbook. New York: Guilford Press.